Gender has transformed; we don’t have a chairman anymore, we have a chairperson, we don’t have an authoress anymore, we have just an author. But, we haven’t stopped using gender names completely; example the female of a goose is gander while the male of a wizard is still witch. 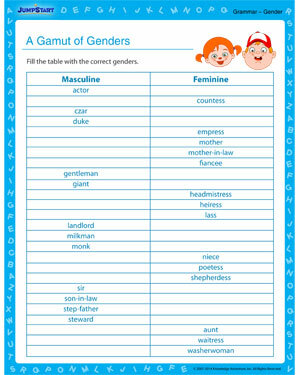 Download ‘Gamut of Genders’, a grammar worksheet, with the relevant gender names for kids to learn. Have fun learning!